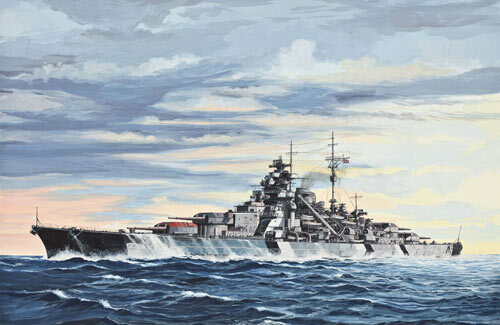 All Products > "05098 Revell 1/7000 Battleship Bismarck"
The Bismarck and the Tirpitz were the two largest battleships in the Second World War. 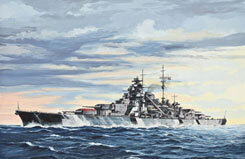 The Bismarck, with a length of 251m, went into service on 24.08.1940. On completion of the training runs she took part in the Rhine exercise. On 24.05.1941, in a sea battle off Greenland, she sank the British cruiser HMS Hood. Then the Bismarck, having damage to the bow, made for a Frenchport. During the pursuit by British ships and aircraft the ship was rendered unfit for action by enemy fire and scuttled in the Atlantic.